Update: Catalunya closed its doors in 2016. Reputations in the world of haute cuisine can sometimes be a dangerous thing. It sets expectations which can inevitably lead to diners being disappointed if the context to which the reputation relates has been changed or is different. Take for example the recent opening of the burger joint, &Made, in Singapore. 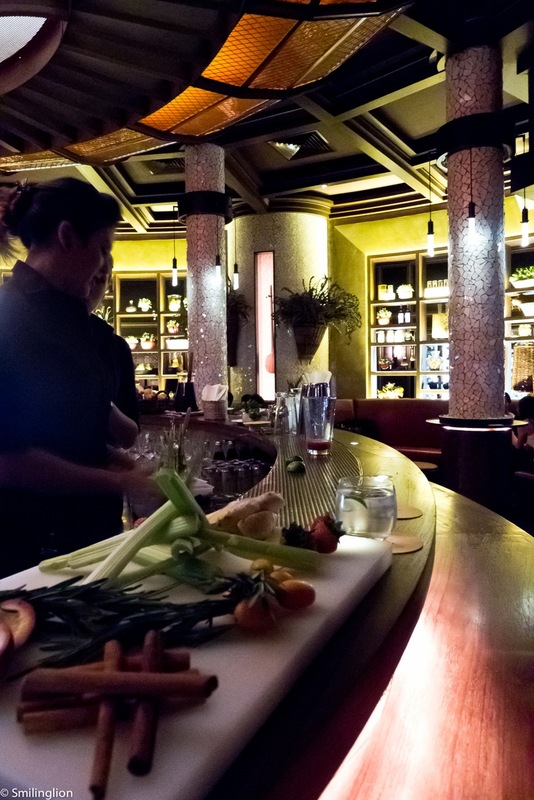 It is part-owned by the famous 3 Michelin star chef Bruno Menard of Osier Tokyo fame. We've heard friends and others comment that they were expecting much more from &Made by mere fact that it was opened by a top French chef. But the fact is, if you were to visit &Made without prior knowledge of its background, chances are you would have had a decent and probably enjoyable burger meal at prices commensurate to a diner of its nature at its location. It is as if someone like Bruno Menard is not allowed to take it easy and open a simple eatery, and that everything he does must be 3 Michelin star standard (the man is on his sabbatical while Osier is being renovated, by the way). The same thing (with regard to expectations) could happen to Catalunya, a newly-opened Catalan restaurant in probably one of the best restaurant locations in Marina Bay area. Constructed as a glass-enclosed dome on an artificial platform on the bay, it directly overlooks the landmark Marina Bay Sands casino and the Singapore Flyer. Access to it is by way of a walkway just outside the Fullerton Bay Hotel (which raises questions about how one gets there if it is raining). Catalunya is a collaboration of a handful of Spanish chefs with very impressive CVs, which include stints at places like El Bulli. Before its opening, there was already a buzz around about a new restaurant to be opened by El Bulli chefs, which set a rather high and specific expectation of what the new eatery was going to be all about. Given the hype, reservations were justifiably hard to come by, but the reservations people at the restaurant were quite proactive in letting us know what other available dates and seatings we could get, despite us not being to get a table on the date we wanted the first time we called. 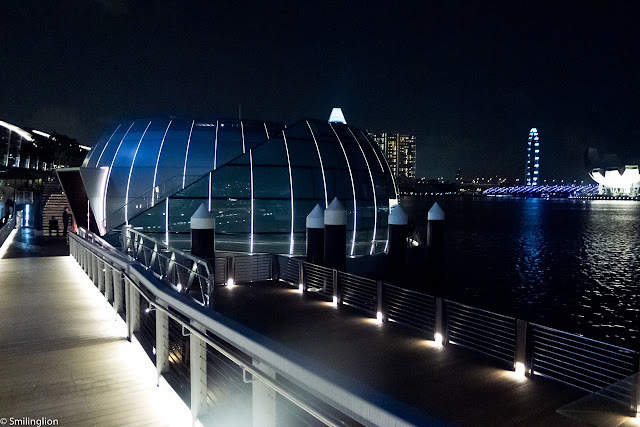 The bar and tapas area dominated the centre and inner part of the dome, and the main dining area was located on a lowered platform along the circumference of the dome, giving full views of the Marina Bay. The bar and tapas areas took walk-in guests and didn't take reservations (as far as we know), while the dining areas served the same tapas as in the bar but had a wider menu of food. 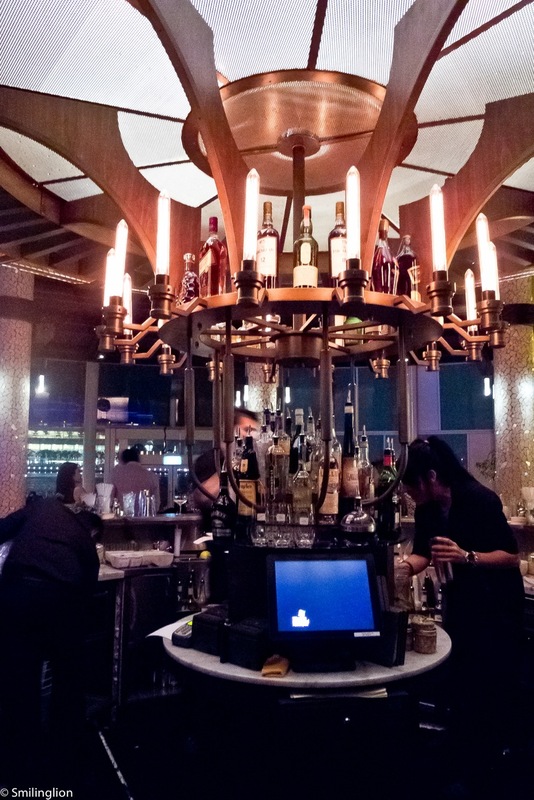 One 'design-flaw' of the restaurant was that the booth tables in the dining room lie directly next to and below the bar counter, allowing patrons at the bar counter to literally look over the diners at the booth seats. As is the trend nowadays, the bar was run by a group of very talented cocktail mixologists (all appeared to have come from Spain) who mixed up a couple of really nice drinks for us while we were waiting at our bar for our seats to be ready. 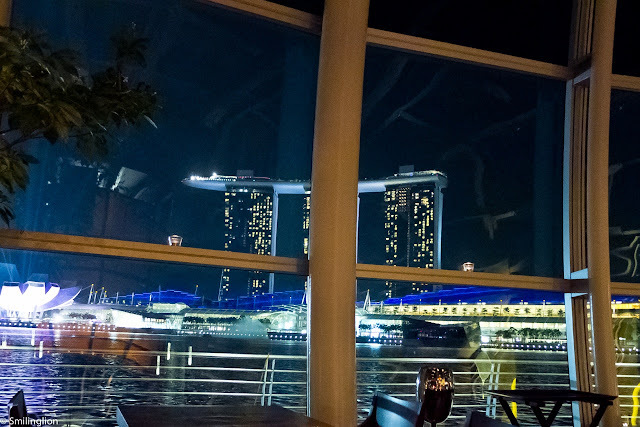 At the dining area, the large window panes gave all diners a perfectly clear view of Marina Bay, in particular, the Marina Bay Sands casino. This would be the ideal location to watch a fireworks show over the bay on New Year's Eve or during the National Day celebrations. And on any other night, diners will usually be treated to the nightly laser show taking place right in front of Marina Bay Sands. For dinner, we picked out a few tapas dishes from the menu as well as one main course dish and dessert. We paired the meal with a few glasses of Spanish Rioja which weren't memorable. "Escalibada" with Foie Gras and Smoked Eel: This was a good dish. 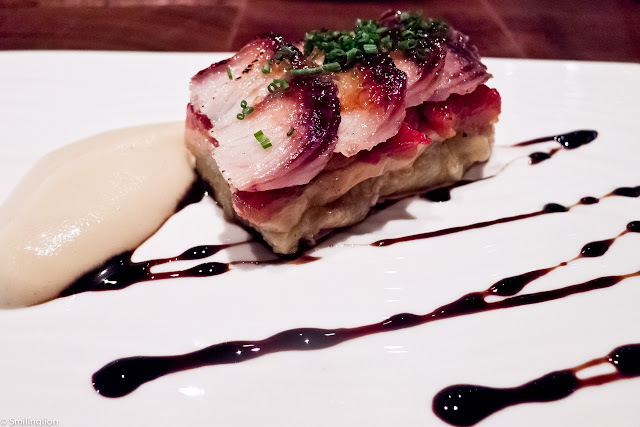 The eel and foie gras worked well on the base of mushy eggplant. Tortilla Omelette "Deconstruccion": The best dish of the night, and one which gave a hint of the chefs' El Bulli background. 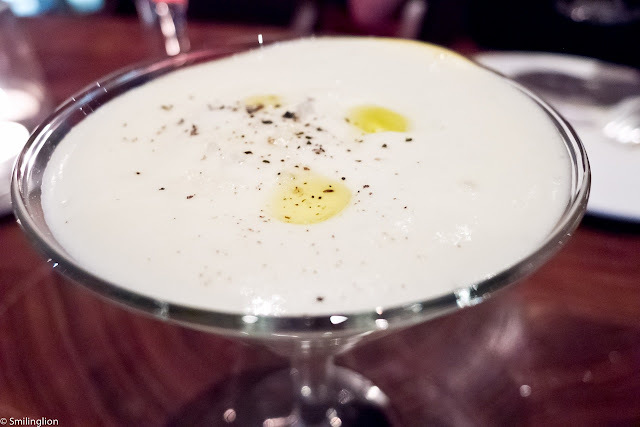 It was layers of liquid and foam in a cocktail glass, which when scooped through to the bottom, gave a very strong and distinctive flavour of the Spanish omelette. 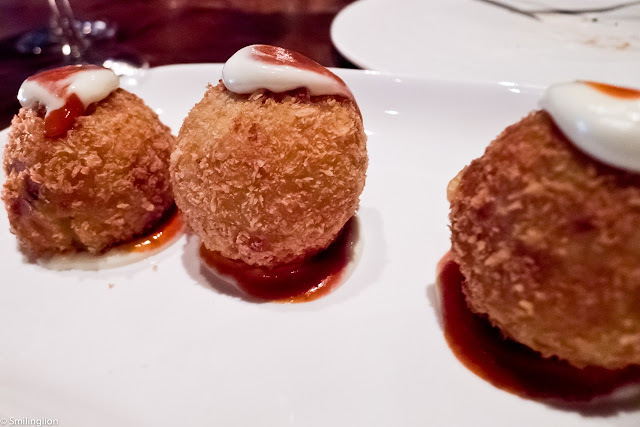 Bombas from "Barceloneta": A classic tapas, this was deep fried potato balls with meat bits. What made it a bit more special than the usual was the chili sauce which accompanied the mayonnaise dressing. 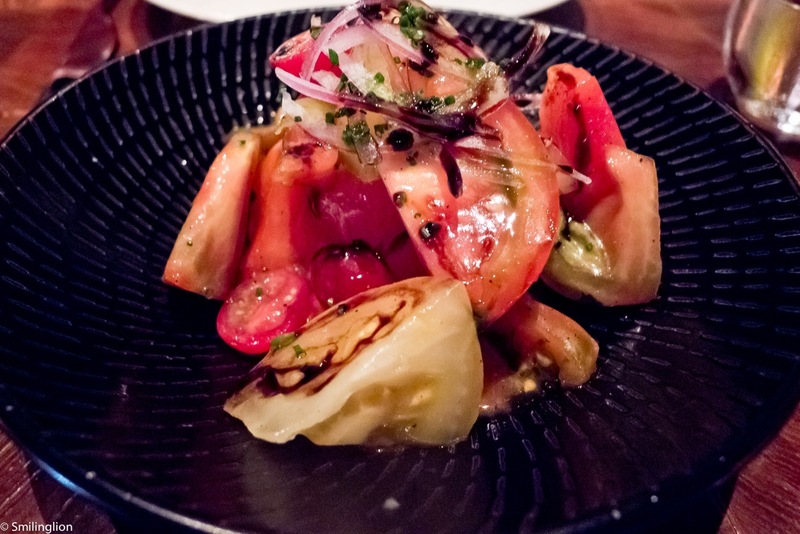 Tomato Salad: We asked for a simple tomato salad to accompany the sucking pig. Traditional Suckling Pig "Segovian Style": This was the much talked-about main course here. 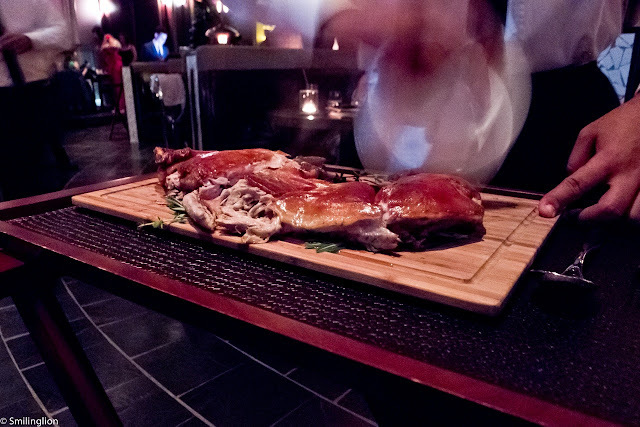 Though it was just the two of us, we were served half a little piglet. It was cooked so tender that the waiter demonstrated cutting it up using a plate (apparently a very Spanish thing). The skin was roasted perfectly to a thin crisp, and was sinfully addictive. 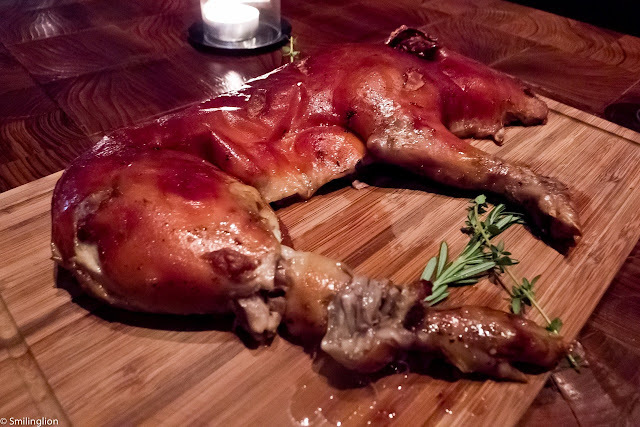 The meat was very succulent and tender, and literally fell from the bone. My wife felt it was a tad bit gamey, though I myself enjoyed such flavours. Try as we did, we were not able to finish this and the waiter kindly vacuum-packed the rest for us to take home (we cooked the leftover portion with pasta the next day - it was fantastic!). We don't usually get fazed by big portions of food but this was more suited for three to four persons. 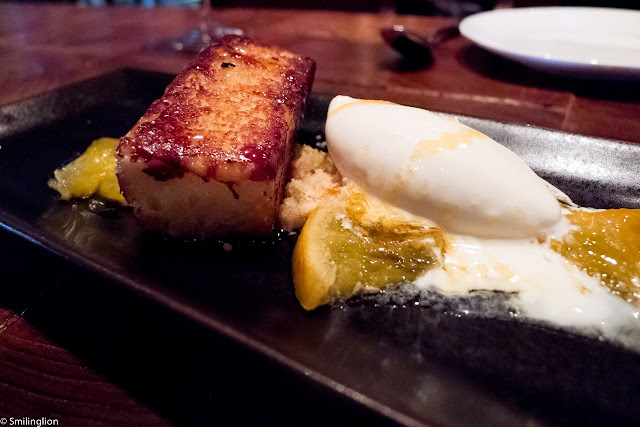 "Torrija" with Milk Ice Cream: After such a filling meal, we were looking forward to a refreshing dessert but unfortunately our choice of dessert this time was a bit simple. This was something which resembled a french toast and vanilla ice cream, neither of which was remarkable. 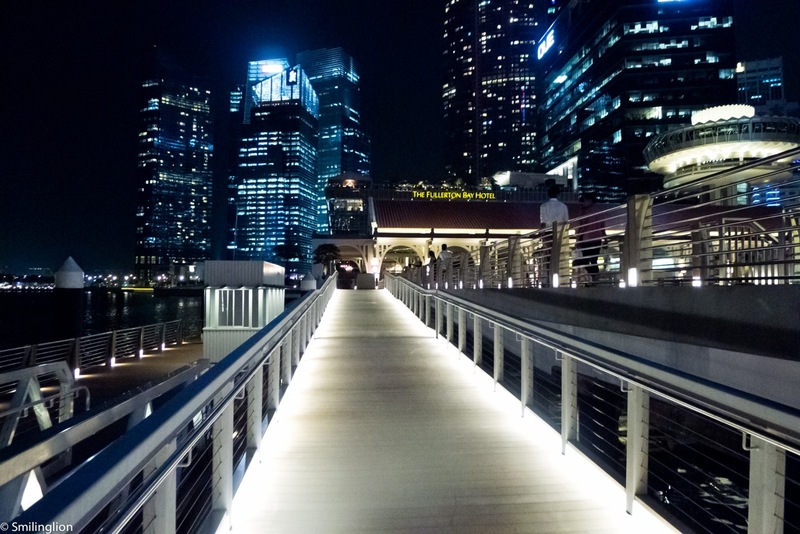 Final Thoughts: This restaurant is in a great location, on a custom-made platform on the iconic Marina Bay overlooking the Marina Bay Sands casino. When we were there, the cocktails were good, the service very friendly and the ambience buzzing. This was no fine-dining restaurant, but was a hip cocktail and tapas bar with a proper dining area (which served main courses in addition to the tapas). 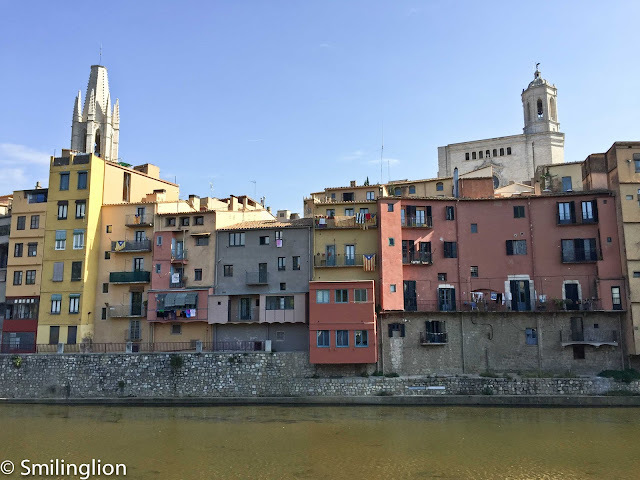 As it turned out, despite the stellar background in molecular gastronomy of the chefs, it appeared that they decided to stay clear of that and introduce traditional Catalan food in a more casual tapas setting instead. The food was good and some dishes were memorable, and together with its predominantly Spanish staff and bartenders, we felt that the restaurant managed to bring to our shores, to some extent, the Catalan cuisine and dining experience. 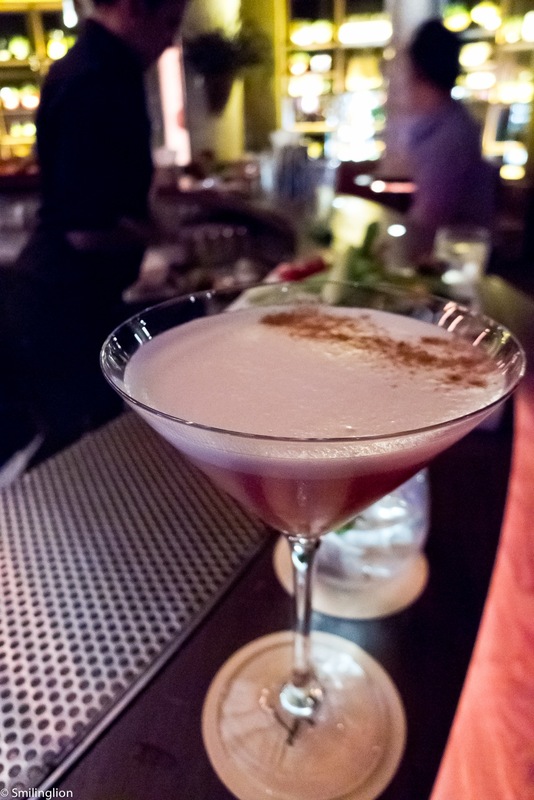 It is certainly a welcome addition to the growing variety and sophistication of the Singapore dining scene.